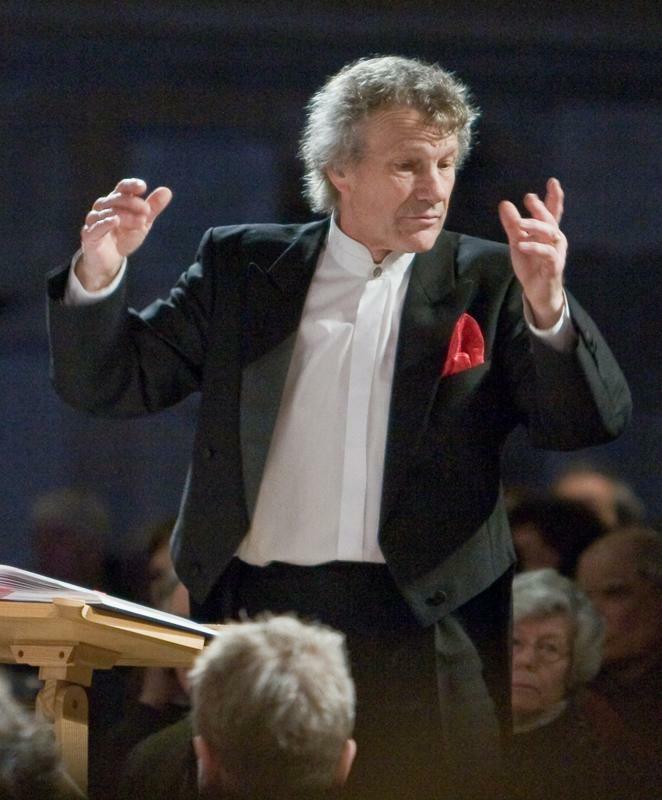 This summer, the sixteenth Run by Singers Assisi Summer School will be directed by Special Guest Conductor Nigel Perrin, who directed the very first Assisi event. He has chosen the sublime - but challenging - Pizzetti Requiem for his return. This will be interpolated with equally gorgeous motets - see below. The whole programme should sound really splendid in the Basilica. 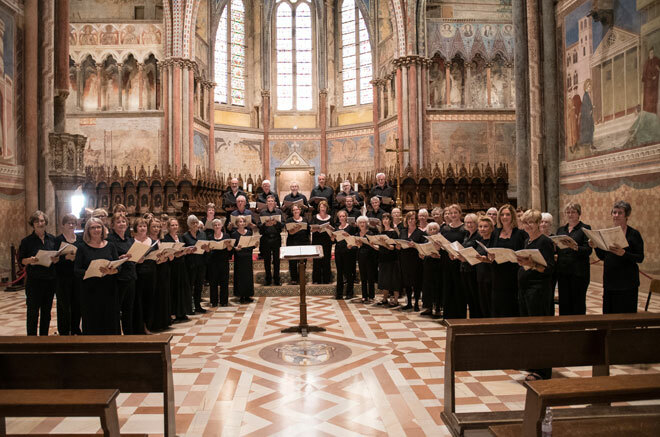 The Assisi course runs from Sunday evening, when we meet for a welcome drink and dinner, to the following Saturday evening where we perform our new repertoire at a concert in the Basilica of St Francis. We will sing for approximately five hours each day with breaks for coffee and a long afternoon break. Thursday will be a half-day when people may choose to explore a little further afield. Participants should have good sight-reading ability and must be prepared to study the music beforehand, although nobody is expected to be note-perfect on Day One. It also helps if you enjoy good food, good company and the occasional glass of wine. We all eat together most evenings in a selection of different restaurants where everyone will soon get to know each other. Our singing holidays have proved equally popular with people travelling on their own and singing couples. Assisi is a beautifully preserved UNESCO site but it is hilly, there are steps everywhere and precious few ramps. it is likely to tax anyone who finds walking, climbing and standing difficult. "Remarkably, one of the most frequent requests I receive is “When can we do the Pizzetti again?”- yet the challenges of the piece are regularly underestimated by choirs. Ildebrando Pizzetti (1880-1968) was brought up singing Palestrina in his church choir, so his music is steeped in Renaissance polyphony, but his ambition was to compose Puccini style opera. Mix these two elements together and you get Messa di Requiem. I know no other piece like it. It is full of intensity and drama requiring technical ability and stamina to bring off successfully - but you'll get hooked on it in the process! The work will take a lot of focus to master, so I am contrasting and interpolating Renaissance anthems and motets by two of my favourite English composers. Each is a gem of English C16th church music, and I am hoping they will be generally familiar." There is a wide choice of accommodation available in Assisi from the campsite to convenient three star hotels - with dozens of one and two-star hotels in between. We have been coming here every year since 2003 so we have discovered that most people like to stay in the same two or three hotels nearest to the rehearsal room; we will send you an annotated accommodation list of those hotels on registration. 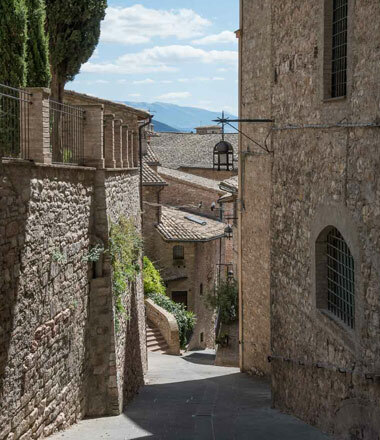 Assisi is a hilltop town so please bear this in mind when deciding where to stay. 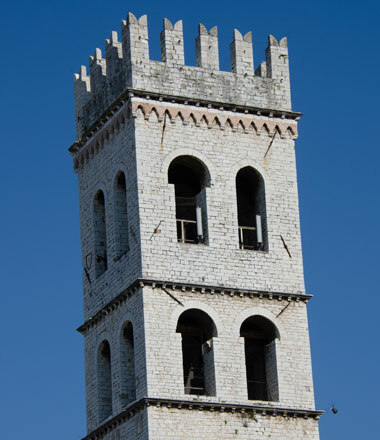 The rehearsal venue is near the Piazza Commune, the main square of Assisi. This bit is up to you and is not included in the course fee. The nearest international airports are Perugia, Rome and Ancona. Although it is no longer the nearest airport, there is an excellent direct rail link from Rome to Assisi so some participants will favour this route - often spending a day or two in Rome. 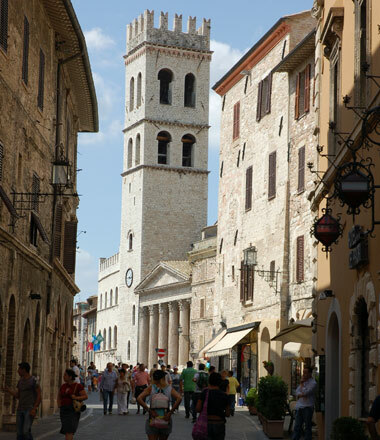 Assisi is accessible by road but the town centre is a car-free zone. Please check Assisi Online for more information about traffic restrictions. The course fee is payable in two stages - £195 on registration and a balance of £395 which will be invoiced approximately eight weeks before arrival in Italy. This covers tuition and four evening meals but not transport or accommodation. Music - which can be kept - will cost £25.00 for everything you need and will be mailed to you six-eight weeks in advance. You will also need to organise your own travel and health insurance. Non-singers are welcome to join us - subject to availability - and pay just £160 to cover their meals.